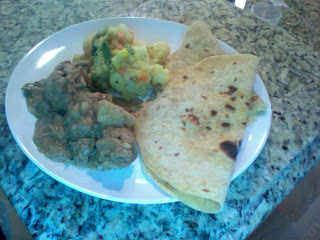 Last night hubby made chicken curry, so today I made potato curry and chapattis to go with it. 2 green chili's or more if you want it spicier! add cooked potatoes to onions with a little extra water, and frozen vegetables, this is not really traditional but as a dietitian I always add veggies! Yum! I love curry with just about everything! We went for a delicious Kerelan meal last night - I love all of the flavours, especially the fresh chutneys, and everything looks so beautiful. I think it's wonderful that you are introducing Jasmine to so many great tastes (without the salt and chilli, naturally!). Is that chapatti or flat bread you're having there? Looks really good! 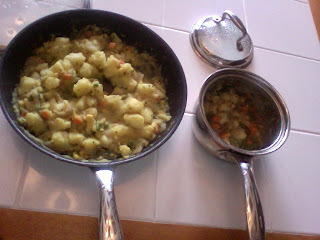 Oh boy, your sweetie can really eat the whole little pot of potatoes? I added your new new link (blogspot). I haven't tried cooking curry food but I would adventure cooking it soon. I don't know why but I associate Indian food with Fall and Winter- except for Tandoori Chicken and raita. I dont know why. This sounds wonderfully delicious. Beautiful! Looks wonderful. And I updated Google Reader so I can keep up with what you're up to! This sounds fantastic. Love the use of the curry with the potatoes this way. Perfect. I soooo wish my family like Curry. Maybe I could make this just for me!!! Thanks for your sweet comment on my TV segment! Simply delicious! a great combination of flavors. this looks like a perfect Indian meal.....perfect chapatis. i dunno why i am not getting your feeds in my reader....goin to check that first..
Wow, Rebecca, you even make your own chapati. Brilliant! This looks delicious! I wish I wasn't the only one in my family who liked curry! Reeni: poor thing you can do like I do for Jasmine make one spicy for you and one without!! I love a good curry. It is definately something I can eat on a regular basis! Sounds delicious - I love curries! this sounds grat, cant wait to try it. i always add veggies to everything. lol so im glad you did. Nicole:thats cool to add veggies makes for a healthier meal!